My grandchildren will grow up and read about Trayvon Martin in their history books. Secondhand accounts will detail the tragedy that had caused pain, outcry and anger of the generations that had come and gone before them – but would they understand its impact. History teachers will give them assignments of research papers and essays in an attempt to have them convey their feelings about an event that had happened years before they were even conceived; so how could they truly philosophize the detriment of Trayvon Martin’s death and its aftermath. Just as the senseless deaths of Emmet Till, and the four little girls bombed in Alabama had been discussed and pondered over in my household for years. But the anguish, and confusion that my siblings and I felt, could had never mounted to what our mother described as she told the story of how she was made to feel when those horrific, and unspeakable pieces of history were being made less than four hundred miles away. The same held true for the killing of Trayvon Martin in February of 2012. I’ll never forget how personal it felt, and how I had become paralyzed by the horrific details that had spread over the world faster than the waters of Katrina had engulfed the city of New Orleans. I watched the events unfold on every news and talk show, every newspaper and magazine across the nation. Even the internet could barely keep up with the massive amounts of daily coverage. I listened attentively as it was talked about on radio stations, the comments and thoughts expressed by colleagues, family members, and friends. The content of the conversations with my own sons, teenagers themselves at the time, had now become more focused and deliberate. I had started to obsess over their interactions with the police, the neighbors, and their friends – white and black. My sons were more like Trayvon than what I cared to think about. Not only in physical characteristics, but they even shared some lifestyle traits. How often had it been that my boys – clothed in stereotypes – had left walking with just the intent of eating at Waffle House or playing basketball at the park. They could had easily been intercepted by “a” George Zimmerman; just as Trayvon had innocently left home that fateful night in February for only Skittles and tea – never to return. 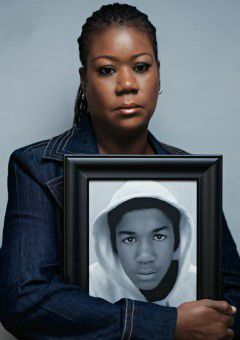 When word got out that Trayvon was shot and killed that night, I felt as if that gun had been aimed at all of our sons, but it was Trayvon who had paid the ultimate price for all of them – for being young and black. Yes, our sons are Trayvon Martin. And every mother of every black and brown baby is just as much Sybrina Fulton. Emotions were at an all time high, and people had started to rally all over the world. It was imperative for me that my sons and I would make our way to at least one. I had to do something to calm this indescribable urgency that had started to erupt inside of me. So when one of the first Justice for Trayvon rallies hit Atlanta, we put on the hoodies that I specifically bought for the event, and joined thousands of others who had been moved as well by this gross act of injustice. There were people from all walks of life – blacks, as well as some whites; carrying Skittles and tea, walking, standing still, holding signs, some crying, some chanting – all in the name of justice. Zimmerman’s acquittal was just as emotional for me as the act of him killing Trayvon. I never perceived him to really be on trial that day. It was the character and the lives of our children being judge in that courtroom – by the jury, and the world, and we had lost again. For me, finding him not guilty was a subliminal message for the entire black community; we would never win no matter what. Some would argue that we’re fighting the wrong battle, that a bigger loss lies in our plight of Black on Black crime. But the overall crime rate of only one community should nowhere near be enough – if it is at all fair – to measure up against any violence committed against an individual with any form of categorization (race, religion, sexuality, etc.) as the root cause. Not only that, statistics show White on White crime to be just as high, if not higher. Crime in our community is just given a bigger spotlight by everyone, including some of us. So why not choose the battle that poses a bigger road block on our journey to justice; the same battle our ancestors of The Civil Rights Movement fought long ago. But this is not just a fight for any one race over the other. Restoration of true justice could only be given by our Heavenly Father, but if we’re to have any hope of justice in this earthly system, the fight for it must cross all racial barriers. If not, justice remains just what it is and what it was on July 13, 2013 – a mere word tossed around our legal system like a softball in a false attempt to placate the voiceless. But the ball has yet to end up in our hands.